One year ago cybersecurity experts discovered the world’s first known cyberattack on a safety instrumented system. Some called it Triton. Others named it TRISIS. Still others, Hatman. Yet regardless of the name, everyone agrees that it prompted a call to action for every industrial process and manufacturing enterprise in the era of the Industrial Internet of Things (IIoT). What was once considered theoretical became a real threat to every industrial safety system, everywhere in the world, no matter who designed, engineered, built or operates it. As a director of cybersecurity and architecture at Schneider Electric, I have been intimately involved in the Triton investigation, exploration of the attack’s industry-wide implications, and steps to strengthen resiliency both in the here and now and for tomorrow. I am encouraged by the progress made over the last year, yet there is more work ahead. In fact, building cybersecurity resilience is an ongoing pursuit if we’re to ensure the reliability and safety of assets in an increasingly digital world. Aggressive “cybersecurity by design,” including cyber hardening of platforms on the part of designers and engineers and throughout the entire supply chain, along with rapid adoption and education on best practices and procedures on the part of plant operators and owners. Consistent and widespread adherence to global security standards across the operational technology spectrum. Open and honest collaboration among plant asset owners, suppliers, designers, engineers, plant operators, third-party providers, integrators, standards bodies and government agencies around the world. Fifteen years ago, before the advent of the IIoT, the cyber threats we face today were unimaginable. In the case of Triton, the Schneider Electric controller at the targeted facility performed as designed, bringing the plant to a safe state via a shutdown and thus averting a disaster. The subsequent investigation identified security lapses onsite, however, that allowed the perpetrator (recently identified as Xenotime) to infiltrate the system via more sophisticated means than our industry had seen previously. It’s now clear that to shut the door on future, Triton-like attacks, adopting an end-to-end security approach is critical — from product design to installation to rigorous onsite operations. The need to update legacy systems and processes is clear. 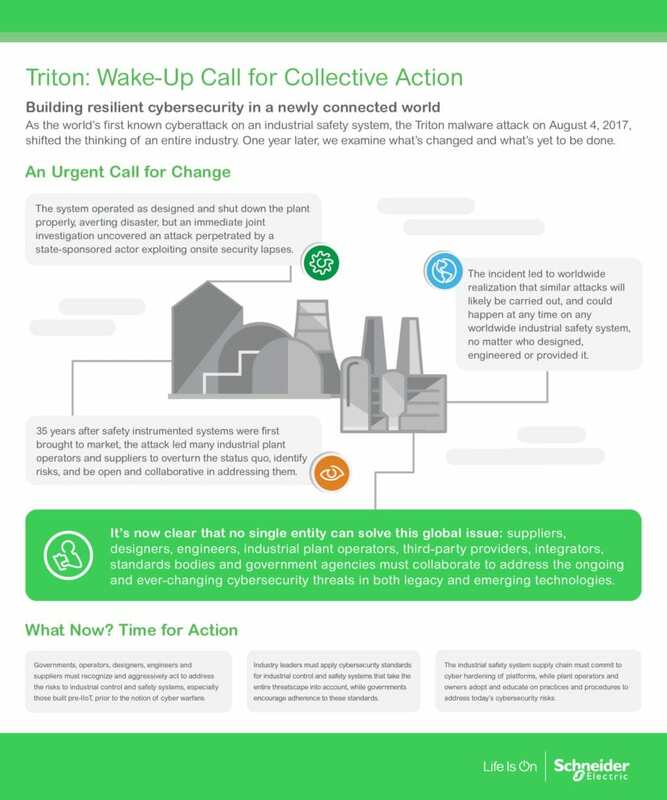 But Triton also exposed the urgency for suppliers, designers, engineers, industrial plant operators/owners, third-party providers, integrators, standards bodies, and government agencies around the world to adopt and adhere to cybersecurity standards for process control systems. One of those is IEC 62443, a rigorous standard for industrial automation technology that safeguards operations across multiple layers. And there are others, such as the French GTCSI (ANSSI) standard and ISO 27001.
working together as an industry to move forward safety in the digital landscape. The presence of malicious attacks at this level is our new reality. We have the means to ward off “successful” attacks — as well as build and advance a resilient “detect and response” cybersecurity strategy across all levels of an industrial enterprise — but only if we take immediate, collective action. Now is the time for this collaborative effort. I’ll be sharing additional thoughts on preventing cyberattacks in this blog series. Up next, we’ll examine current legislation and its role in the prevention of future attacks. For more insight from Schneider Electric on cybersecurity, download our whitepaper: “Cybersecurity Best Practices”. 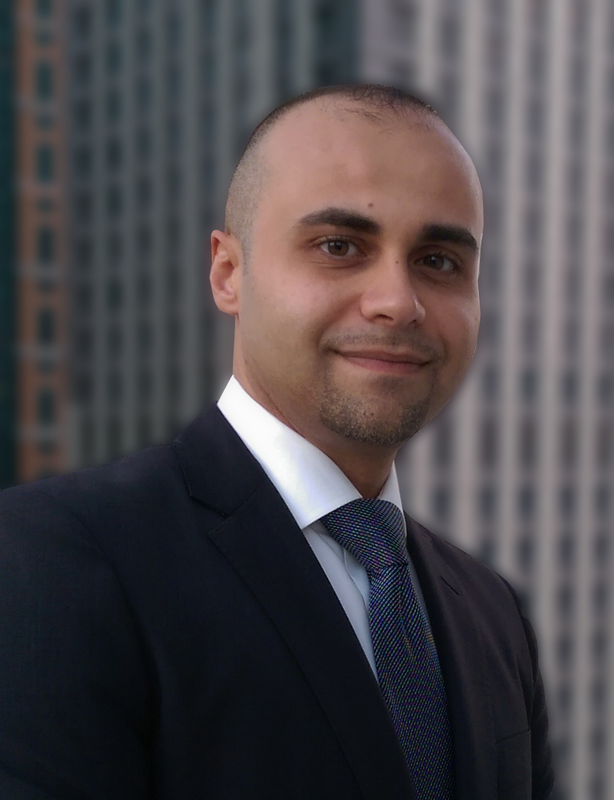 How safe are your building operations from cyber attacks? Cyber-Nationalism in Cybersecurity Standards For Operational Technology (OT), Make Cyber Resiliency and Reliability of Operational Process and Assets Your Top Priority Cyber Security Regulations: Key to Managing Banking Industry Operational Risk?